Mauna Loa Observatory (MLO) activities occur at several locations around the Big Island of Hawaii. The primary observation site is located at an elevation of 11,141 ft on northern slope of Mauna Loa. This facility is generally refered to as Mauna Loa Observatory, or the MLO Site. Behind the scenes, the administration and data processing for MLO occurs at the Hilo Office. Kulani Mauka Site is a rain collection site (see National Weather Service programs). 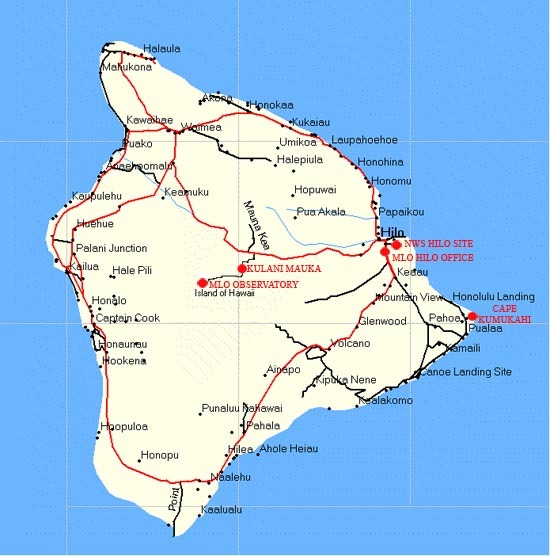 The Cape Kumukahi Site is a flask sample site located on the eastern most point of Hawaii, used in several programs. The Natiaonal Weather Service Hilo Airport Site is where weekly ozonesonde and special water vapor balloons are prepared and launched (see ozonesonde program page). The Hakalau Site is a rain collection site for future programs (see EPA Mercury Precipitation program). Click on the map to get more information about these sites.